For years, I have respected and admired the Cuban boxers’ masterful style and movement in the ring. Some more than others, flaunt an elegance that is not easy to imitate, which also has a speed that is difficult to counter. Personally, I had the opportunity to meet, during their years of amateur, most of the crop of Antillean boxers who are now professional boxer, and my favorites always were Erislandy Lara, Guillermo Rigondeaux and Yuriorkis Gamboa, because of what I mentioned above. Although I hated them whenever they fought against Venezuelan boxers, it was a pleasure watching them shine in international competitions and Olympic Cycle. They were superior, big and as we say at home out of the bulk. However, shining in professional has not been easy for them. They still have a fast boxing, showy and elegant, but according to some, that makes them bored, runner and unappealing. Consequently, there are people who have made accusations of xenophobia and racism due to their lack of prominence in the media and large boxing cards. I do not justify these fighters; I just say that is their style and it is very marked. The Mexican School makes them warriors, the Cuban School makes them stylist and fast on the ring. I bring this up after Lara’s defeat against Saul “Canelo” Alvarez in their last non-title fight. Two well-marked, different styles facing but that never caught the public like, but that brought up criticism and discrepancies in the scores. Understanding boxing is not easy, even for the experts. Not only for not being able to distinguish punches, their names or how to throw them, but because their appreciation and assessment are part of the result. There are judges that evaluate the consistency and effectiveness in every round, other value aggressiveness and initiative, while others value more the boxer who throws and lands more punches. It is very easy to criticize and even offend a boxer because he did not performed as they think they should have, but, would you enter in the ring and would you do it better? The same happens with any given judge or referee, could you handled critics, pressure and do it better? Boxers, managers, journalists, public in general, everyone, have an opinion about an athlete performance, or the result of a fight. The thing is…do you prefer a stylist and fast boxer or a puncher, a warrior who like the closed fight or those boxers who enter the punching and knock his opponent without sweating a drop? Also, love or visceral hatred is bad. Sometimes we say I don’t like that boxer, I dislike him, he was helped, he is a protégé, we say that without knowing him or giving him the benefit of the doubt. And so this poor mortal who almost let life on the ring, is the victim of comments like “they helped him” or worse still, “judges were bribed” or “that fight was arranged”. There is a saying “some are born with star while other are born smashed” regarding some boxers’ luck and light that without doing anything, receive all the cheers. On the other hand, there are others who sweat but never earn respect. I insist, boxing isn’t easy, it is much easier to accuse a boxer of being bribed, another of being helped, or pointing to a judge or referee of crocked. 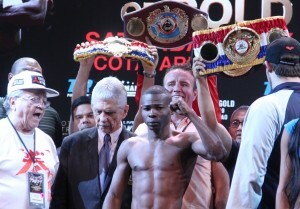 I go back to the beginning, the critics to Lara, Rigondeaux and Gamboa (taking them as example) ¿Is it because they are Cubans, for being stylists or simply because people like better explosive and warrior boxers? If anyone has a clear, logical answer, please let me know. Here I wait.